In the entire world, there are arguably only two fabled cruising grounds that every charter sailor aspires to visit — the British Virgin Islands in the Caribbean and the Bay of Islands in New Zealand. 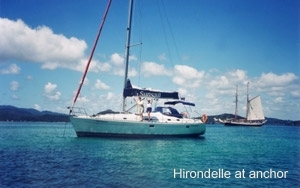 My partner Sandy and I had sailed the BVI a few years ago. 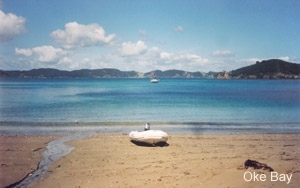 With one down and “down under” to go, we planned a sailing holiday in 2002 to the Bay of Islands (BOI). However, our research revealed another popular sailing area in New Zealand — the Hauraki Gulf, 120 miles south of the BOI. Both areas were described as spectacular with much to see and do. Sunsail Charters suggested we pick up the boat at their base in Auckland and drop it off 10-days later at their base in the BOI. This option would allow us to sail both areas and also take advantage of prevailing south-westerlies. Perfect! We booked for mid-February, late summer in New Zealand, and invited our friends Sue and John to join us. Neither had ever sailed before, but both were keen. We flew from Edmonton to Vancouver to Auckland, allowing ourselves one night to recuperate at the Redwood B&B in Parnell, a fashionable district 10 minutes from the marina. The next morning, we met with Toby of Sunsail for our boat and chart orientation. A sleep aboard Hirondelle allowed us a visit to the Royal New Zealand Yacht Squadron to view the prestigious America’s Cup, won by Team New Zealand in the last two competitions. 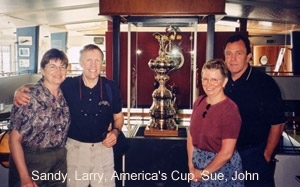 Although the challenge race was not until February 2003, the waterfront was already abuzz with activities in preparation for the big event — a very exciting place for sailors over the coming months. Our first stop was Islington Bay also known as “Drunken Bay” because early sailing ships would stop here to allow their crews to sober up after over-indulging in Auckland. This bay is at the base of an extinct volcano, Mt. Rangitoto, a prominent geological feature marking the entrance to Auckland Harbour. 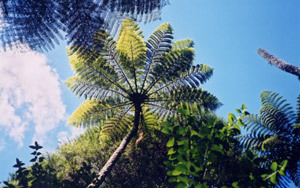 The cone-shaped summit offers panoramic views of Auckland and the surrounding islands. Our second day’s sail took us slightly further east to Oneroa Bay on Waiheke Island. We saw our first little blue penguin along the way, swimming and diving much like a duck. Waiheke is one of the largest and most visited islands in the Gulf. Its close proximity to Auckland allows for easy commuting and it is a haven for art lovers and wine connoisseurs. We toured a nearby vineyard and purchased a bottle of their Waiheke Red. Our itinerary had us heading 20 miles north to Kawau Island. The previous short sails in sheltered water were ideal for introducing our neophyte crew to the joys of island hopping. Day three dawned with 25-knot easterlies. Blasting into 2-meter swells, we occasionally took spray over the bow. With John smiling at the helm and Sue hollering YEE-HAW after each dousing, they were well on their way to becoming seasoned sailors! We anchored late afternoon in Bon Accord Harbour. The next day, we re-located to nearby Mansion House Bay, so named because of the stately mansion that presides over the bay. This historic house operates as a museum, displaying a collection of Victorian artifacts. Several paths lead to beaches, an old copper mine and an impressive lookout. We were fortunate to see several wallabies along the way as well as peacocks and other exotic birds. By next morning, a brisk northwest wind provided a comfortable beam reach on 30 miles of open ocean to Great Barrier, the largest island in the Gulf. Rugged and isolated, it has numerous tramping trails, beautiful sand beaches, historic kauri-timber dams, and a few natural hot springs. We anchored in Whangaparapara Harbour, a scenic fiord-like bay surrounded by high hills. The next morning, we sailed up the coast to the harbour of Port Fitzroy, once a major whaling centre but now catering mainly to boaters. We spent a couple of hours tramping Warren’s Track through a coastal forest to an impressive 21-meter waterfall. We set out early in a northwest direction for Tutukaka, a small village on the mainland. The wind had shifted to the south-west, allowing us to sail the entire 9 hours on one tack. About halfway, a huge sperm whale surfaced and spouted right beside our boat. Scared the bejeebies out of us! This guy was larger than our 38′ Beneteau, staying alongside for several minutes. He then dove under our boat and came up on the other side, again parallel to our boat. Finally, he submerged and we never saw him again. Our dolphin sightings seemed uneventful in comparison. A brisk southerly pushed us the remaining 25 miles to the BOI. As we entered the Bay, one difference became immediately apparent: the lack of ocean swells resulted in a smoother sail. We anchored for lunch and a refreshing swim in Deep Water Cove on the inside of Cape Brett, then moved on to Oke Bay for the evening. This mainland bay has a fine sand beach and makeshift stairs leading to a hilltop, site of a Maori cemetery. Many of the gravesites were adorned with flowers, pictures, and various memorabilia commemorating the deceased. The Maori people inhabited New Zealand for hundreds of years before the Europeans arrived. Today, less than 15% of the population is of Maori descent and most place names, including the bays and islands, reflect the Maori heritage. All of our passages in the BOI were under 2 hours, allowing us time to sample some of the 150 islands scattered throughout the Bay. Urupukapuka Island has a 5-hour archaeological walk, a popular café, and a refurbished cabin once used by Zane Grey, the famous author of American westerns, on his big-game fishing expeditions. Moturua Island is great for tramping and Roberton Island renown for its snorkeling. Our final night was spent anchored in the bay at picturesque Russell, an historic town that was the original capitol of New Zealand. Many fine shops and restaurants overlook a busy waterfront. After breakfast, we sailed the remaining 5 miles to Sunsail’s base in Opua, the end of our charter. We had made reservations at Waterview B&B, overlooking the marina, which gave us an opportunity to do our laundry, check our email, and generally get ready for the land-based part of our holiday. That evening, we dined at Omata Estates, a rustic but elegant establishment overlooking a tranquil bay — the perfect setting to review our sail. Having now sailed both the BVI and the BOI, we can’t decide which is better — they are both superb as is the Hauraki Gulf. I guess we’ll just have to return to all three! Both the Hauraki Gulf and BOI deserve more time than we allowed. If you’ve only got ten days, choose one or the other. Take lots of sunscreen and your camera — the sun is hot and scenery spectacular. Set aside $22 NZD for airport departure tax, and keep the receipt to show airport authorities along your way home. Book a two-hour ride on an America’s Cup Boat (NZL40) in Auckland Harbour, a very exhilarating sail.